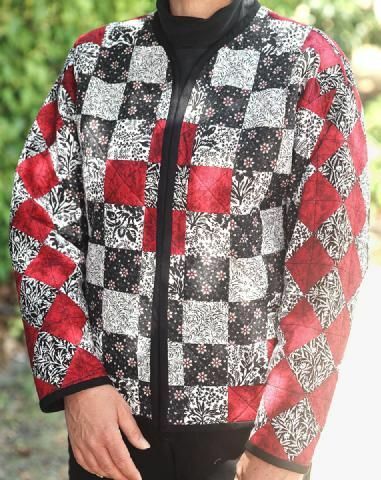 April's Trip Around the World Jacket uses five fabrics, quilt fuse gridded fusible interfacing to make the layout, and a sweatshirt as a foundation. For the sleeves the design is laid out on point, see photo. Add some easy machine quilting and hidden pockets to make this delightful design. This should be a two day class or retreat project. Tall sweatshirts are available on our website.